The CTD probe - which stands for Conductivity-Temperature-Depth - is the workhorse instrument of oceanographers worldwide. Marine scientists usually use it to measure vertical variations in temperature and salinity of seawater, revealing layers of water with different properties that originated in different parts of the ocean. From that information, they can deduce ocean circulation. In our case, we are also using the CTD to hunt for deep-sea vents. The CTD has a thermocouple to measure temperature. It uses a pressure transducer to measure how deep it is in the ocean, because pressure increases by one atmosphere for every ten metres of water depth. To measure salinity, the CTD actually measures the electrical conductivity of the seawater, which varies with the amount of dissolved salts. Our CTD, like most models, is mounted in a metal frame. This frame also carries special bottles, called Niskin bottles, for collecting water samples from different depths. Niskin bottles are open-ended tubes with caps that are held together by a strong elastic band running through the tube. 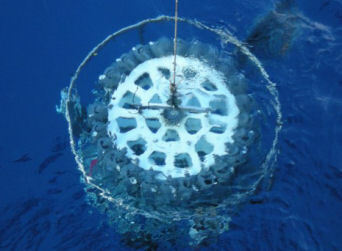 When the CTD is launched, the bottle caps are held open by mechanical catches on the metal frame, so that water flushes through the bottles as the CTD descends through the ocean. But the catches holding the bottle caps open against the tension of the elastic band joining them can be released by an electronic command from the ship. When that happens, the bottle snaps shut, trapping a water sample from that particular depth. The Niskin bottles have taps from decanting the samples when the CTD is back on deck. Resetting the Niskin bottles - hooking their caps back into the release catches - is a ritual after every CTD deployment, and knowing how to do it correctly is considered the mark of a true oceanographer. The metal frame of our CTD is made of titanium, to avoid contaminating water samples collected for trace metal analysis. The taps on our Niskin bottles are made of Teflon for the same reason. For hunting deep-sea vents, our CTD is tricked out with several additional sensors to the standard set-up. These include a Light Scattering Sensor (LSS), which detects particles in the water, such as those from the smoky plumes of deep-sea vents. It also carries an Eh sensor, developed by our colleague Koichi Nakamura, which detects changes in seawater chemistry that indicate deep-sea vents are nearby. The package is completed by an Acoustic Doppler Current Profiler (ADCP), which measures the ocean currents in different layers of water beneath the probe. 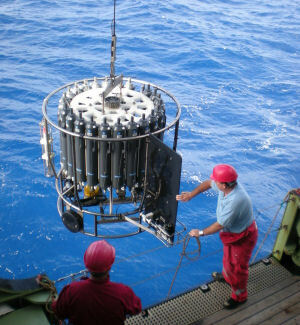 We use our CTD in 'tow-yo' mode to hunt for deep-sea vents. Most of the time in oceanography, the CTD is lowered vertically through the ocean in one location and brought straight back up again. But we lower it to the seabed, then raise and lower it repeatedly (like a yo-yo) over the lower few hundred metres as we move the ship around. We know that the plumes of mineral-rich fluids from deep-sea vents disperse in that bottom layer of the ocean. Our tow-yo surveys allow us to sniff out their source with the CTD, by looking for the strongest signals as we move around.